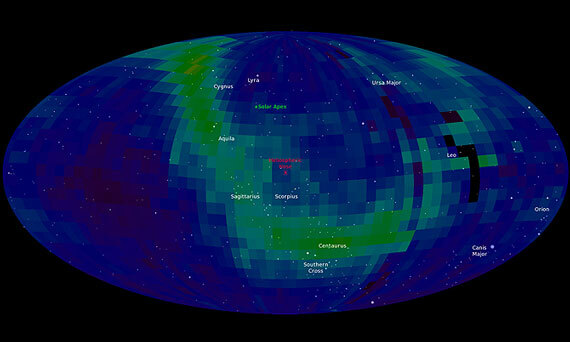 (Nanowerk News) The vast edges of our solar system – the boundary at the edge of our heliosphere where material streaming out from the sun interacts with the galactic material – is essentially invisible. It emits no light and no conventional telescope can see it. However, particles from inside the solar system bounce off this boundary and neutral atoms from that collision stream inward. Those particles can be observed by instruments on NASA’s Interstellar Boundary Explorer (IBEX). Since those atoms act as fingerprints for the boundary from which they came, IBEX can map that boundary in a way never before done. In 2009, IBEX saw something in that map that no one could explain: a vast ribbon dancing across this boundary that produced many more energetic neutral atoms than the surrounding areas. Scientists did not know what processes at the edge of the solar system could cause this mysterious increase in neutral atoms, or why any part of the boundary should be different from any other. In the years since, scientists have devised models and theories to try to explain the ribbon and now, building on earlier interpretations scientists have added a new hypothesis to help solve this puzzle. In a paper published in the Astrophysical Journal, researchers propose a “retention theory” that for the first time explains the key observation of the unexplained ribbon’s width. The paper appeared online on Feb. 4, 2013. Indeed, since the discovery of the ribbon, over a dozen competing theories seeking to explain the phenomenon have been put forth. The new theory builds on one that was first published along with the discovery of the ribbon in 2009 and then quantitatively simulated in 2010. This theory posited that the ribbon exists in a special location where neutral hydrogen atoms from the solar wind cross the local galactic magnetic field. Neutral atoms are not affected by magnetic fields, but when their electrons get stripped away they become charged ions and begin to gyrate rapidly around magnetic field lines. This process frequently aims ions back toward the sun. So those ions that pick up electrons at the right time might explain the extra boost of neutral atoms that create the ribbon. The problems were that physical processes might break down the distribution needed for it to work and that models based on this process showed a ribbon narrower than IBEX observed. "Think of the ribbon as a harbor and the solar wind particles it contains as boats," says Nathan Schwadron, the first author on the paper and scientist at The University of New Hampshire, Durham. “The boats can be trapped in the harbor if the ocean waves outside it are powerful enough. This is the nature of the new ribbon model. The ribbon is a region where particles, originally from the solar wind, become trapped or retained due to intense waves and vibrations in the magnetic field." Models done with these waves taken into account agree with the available observations, and the mathematical modeling results look remarkably like what the ribbon actually looks like, says Schwadron. Although the retention theory may check all the boxes, the IBEX team is still far from claiming that the ribbon is fully explained. A major test for the retention theory will be watching how the ribbon changes in step with observed changes in the solar wind. "What we are learning with IBEX is that the interaction between the sun's magnetic fields and the galactic magnetic field is much more complicated than we previously thought," says Eric Christian, the mission scientist for IBEX at NASA's Goddard Space Flight Center in Greenbelt, Md. "By modifying an earlier model, this paper provides the best explanation so far for the ribbon IBEX is seeing." If the theory is correct, points out Schwadron, it will help us understand more about how our heliosphere interacts with the rest of the universe. “The ribbon can be used to tell us how we’re moving through the magnetic fields of the interstellar medium and how those magnetic fields then influence our space environment,” he says. IBEX is the latest in NASA’s series of low-cost, rapidly developed Small Explorer space missions. Southwest Research Institute in San Antonio, TX leads the IBEX mission with teams of national and international partners. NASA’s Goddard Space Flight Center in Greenbelt, Md. manages the Explorers Program for the Heliophysics Division of NASA’s Science Mission Directorate in Washington, D.C.